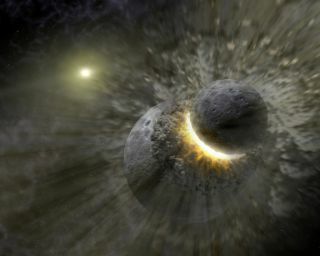 An artist's image of the violent collision that formed Earth's moon. Such collisions could explain the surprising differences in more massive super-Earths and super-Neptunes. Catastrophic collisions may explain differences in giant rocky planets around other stars. A new study suggests that the heat generated by material smashing into a planet plays an important role in removing some or all of a planet's atmosphere. A wide variety of sizes for these deadly asteroids would explain differences seen in the more massive rocky worlds. "Giant impacts are very effective at reducing or removing the hydrogen or helium envelope," John Biersteker told his colleagues last month at the 233rd semiannual meeting of the American Astronomical Society in Seattle. Biersteker, a graduate student at the Massachusetts Institute of Technology, studied how impacts by rocky debris affected the atmosphere of young planets. He found that impacts could create many different types of worlds. "This process can also produce a wide range of outcomes," Biersteker said. "This makes giant impacts a nice explanation for some of the observed distributions for the compositions of super-Earths." After a star is born, the dust- and gas-filled ring left behind begins the planetary formation process. Once gravity pulls together enough pieces to create a core, the newborn planetesimal begins to collect hydrogen and helium from the leftover gas, building its primal atmosphere. Planets that are very close to their stars can be affected by stellar radiation, which heats the top layers of the gas so that it escapes into space, leaving a thinner atmosphere. Eventually, the gas in the disk is either piled onto planets or swept away by the star, leaving behind only dust and rock. Mixed among the small and medium-size debris are the failed cores that weren't able to grow large enough to attract an atmosphere. When these massive objects slam into planets, the collision can blow the planet's atmosphere off into space. One such collision helped to form Earth's moon. A young world still boasts a molten mantle that can make it easier for a collision to strip off its atmosphere. "Giant impacts are an expected part of the formation of these systems," Biersteker said. It turns out that you don't need a massive core to completely remove a planet's atmosphere. By simulating a variety of impacts, Biersteker found that an object only a tenth the mass of the planet can blow off anywhere from 50 to 100 percent of the hydrogen and helium surrounding the planet. A planet's youth may also work against it when it comes to holding onto an atmosphere. When a planet is young — only a few tens of millions of years old — its core is still fully molten, with no crust to insulate it from the atmosphere. Since a hotter atmosphere is harder to hold onto, it doesn't take much of an impact to strip off some of the atmosphere. An object crashing into a planet raises the energy, in the form of heat, allowing more of the atmosphere to be blown away. Biersteker also found that the energy created by the impact was more important than the mass of what crashed into it. That means a small, fast-moving asteroid could potentially strip off more hydrogen and helium than a slower, medium-size object. The angle the impactor hits the world can also affect the energy of the impact — a head-on collision is more dangerous than a sideswipe. "We can expect a wide range of impacts," Biersteker said. With each impact stripping off a different percentage of the atmosphere, collisions can create a wide variety of exoplanet densities. Incoming material with only a tenth of a planet's mass can strip off anywhere from half to all of the hydrogen and helium. The results were also posted online on the preprint server arXiv. Follow Nola Taylor Redd on Twitter @NolaTRedd or Facebook. Follow us at @Spacedotcom, Facebook. Originally published on Space.com.